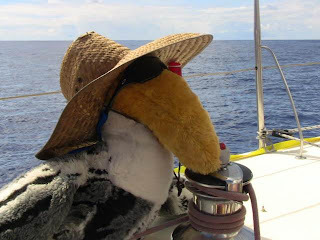 Abby has not rounded Cape Horn yet! The light winds have meant painfully slow progress for her today and for Laurence who is waiting in an anchorage off the Beagle Channel to set out for the rendez vous. 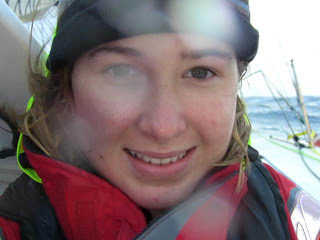 The calmer conditions have given her a chance to get outside and check everything with a good chance of NOT falling overboard whereas the past few days according to Abby there was a good chance of not staying ON board! She was able to work the air bubbles out of the water maker so that is fine and she will finish troubleshooting the back up autopilot after rounding the Cape and before heading eastward to Cape of Good Hope. For now, we all get to learn a bit of patience! Its been a pretty nice, normal day out here. The wind has been a little lighter. I've had about 25 knots all day occasionally picking up to 30-35. I've been making around 8-9.5 knots with just my little stay sail up! 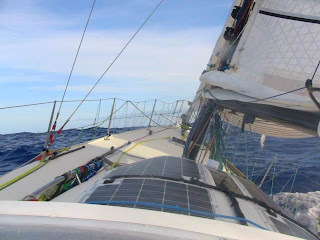 I had been worried that pulling down my whole big main sail would decrease my speed quite a bit, but I was happy to find that it hardly slowed me down at all and is making it a lot easier for my auto pilot to stay on course. I have been gybing at least twice a day as Wild Eyes doesn't sail well DDW (dead down wind). It means that instead of making 200 miles of progress each day, I am sailing a little off course all the time and making more around 150 miles on course. A little frustrating but not much else to be done. The swells are pretty big - about 20 feet. It makes it pretty uncomfortable crawling around down below in the aft end of the boat. I'm using my back up auto pilot right now and I want to get my main auto pilot fixed so that I can use it as a back up. The problem is that there is a pretty bad transmission fluid leak (the steering is hydraulic). I think the leak is in the ram but I can't find it without the auto pilot turned on. I should have some pretty calm weather in a few days so I'll be able to turn off the autopilot, lash the tiller and hook up the first auto pilot and get a good look at things working down below. I've had some problems with my water maker recently. I think it's just that there is air in the tubes and I am really hoping I'll be able to sort it out with the bleeding valves. If that doesn't get the air out, I could have to go through all the hoses back there which really wouldn't be a very fun job. My cabin stays pretty warm, around 47 degrees during the day, and a little colder during the night. The water temperature is 44 so I don't think I'll be going swimming for a little while! For where I am it's incredibly warm. There have been people who have gone around Cape Horn and had 28 degree water. I keep trying to get some new pictures for the blog, but everytime I go out and look around all there is is grey! Behind me are gray walls of water that look pretty scary - like they're right about to break on top of little Wild Eyes. In front, well, lots of water and gray clouds. Tomorrow should be the big day - rounding Cape Horn. The weather is forecasted to settle down so I hope that I will be able to get outside and enjoy the view! Things have gone pretty well today. I've had about 35 knots and 20 foot seas. It's supposed to die down a little tonight but pick up to a nice 30 knots tomorrow. The autopilot has been doing great. I had a few problems with it this afternoon and was a little terrified at the thought of another night without it but it only took a few minutes to get it fixed and now it is running fine again. Salt water had gotten onto some of the wiring of the remote pilot which was messing up the connection. Before the wind vane debate gets started up again, know that there is not a suitable wind vane for a boat as fast as Wild Eyes and that that is why I don't have one. I'm now scheduled to be at the Horn Tuesday. It is pretty exciting watching how much closer I get each day and with all this wind I should be able to make up for some of the time I lost dealing with my autopilot. Right now all I have up is my little staysail and I'm making 9.5 knots! As far as rules for my dad's visit...if there was an official record to get, I would not be allowed to have my dad on the boat or to have him give me anything and we are not planning on doing either. Actually meeting up is a bit of a long shot at this point as it is. Both Guinness and the World Speed Council have dropped youngest records. Off to bed...oh, thanks for all the nice comments. It's nice to know there are people out there cheering me on! Last night the wind picked up around midnight. I was in a squall with about 30 knots for awhile and then it died down a little but stayed at a nice 20 knots for most of today. A nice change from the past few days! I had full sail up because of how light the wind has been recently. It was a little crazy in the pouring rain, pitch black out getting all reefed down. It only took a few minutes but my beanie got soaked through! Its my favorite one, and its quite upsetting to have it all wet and cold! The wind is starting to die down a little now, but with another front coming tonight, I'm hoping it doesn't last for long. It was sunny for most of today which was a great boost to charging my batteries. I had a few squalls, a little rain, and over all a pretty good day. It was 50 degrees down below today and I used my diesel heater for the first time. It was amazing!! Just a few minutes and the whole cabin was nice and warm! Of course I'm trying not to use my heater much to save fuel and its going to be getting a lot colder so I want to save it for that. Because of the last few slow days it looks like I'll be getting to Cape Horn a little later then expected - probably Tuesday. Dad flew out today but won't be to Ushuaia until tomorrow night. Thanks to Julie Watson and their team, he has hooked up with the right people to get him out to say hello. Another day of hardly any wind. I'm just rolling around barely moving. If it weren't for getting so close to Cape Horn I would probably be pretty miserable right now! I should be at the horn by Monday as long as the wind picks up soon. I'm so excited! I can't wait to get down there. It is such a huge milestone. My dad is planning on coming down to 'visit' either by boat or plane so that will be really great! It's been about 55 degrees during the day getting down below 50 at night. It really doesn't seem that bad any more. The initial shock of being cold took a few days to get over but today I was quite comfortable. There have been tons of birds around me recently, just small brown birds (I'm not sure what they are) and booby birds. I've gotten used to having them around, but recently there have been a lot more then usual. I haven't had any birds land on Wild Eyes yet, as Zac did on his trip. I guess big bright wild eyes with the two wind gennys on the back would be a pretty frightening sight for any bird! It seems from the blog comments that some of you don't realize that I do know Jesse Watson. She was in touch with my brother Zac last year on his circumnaviagtion and we have been in touch with email back and forth during the trip. My mom has also been in touch with Julie Watson, Jesse's mom. They are great people and a lot like our own family. Hopefully, we will be able to meet one day! Back to rolling around out here! I have just left the roaring 40s and entered the furious 50s! 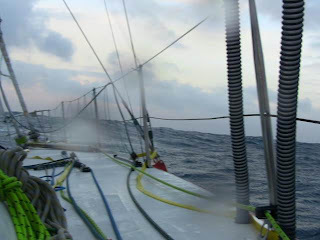 Of course, I have about 7 knots tops right now but I am sailing along at about 6kts. Not all that furious... but I've still got a ways to go so I wont start getting impatient about all this calm weather yet. Its a bit uncomfortable out here at the moment. 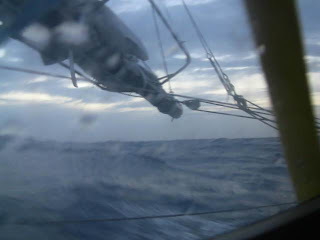 I'm going pretty slow and we have 15ft swells right on the beam, rolling around like this makes every thing hard to do. On a happier note, the sun came out for the first time in about a week! I like rain and weather like that, but being from California, I need a break from it every now and then! It got cloudy again in the afternoon, but it was nice to see even if it was only for a few hours. I saw a ship last night!! Well, I didn't actually see it. Just on my AIS as it was a hundred miles away - a little far to see. But it's the first ship or boat of any kind to show up on any of my equipment in about a month. It may have been just a ship and pretty far away, but its nice to know that I'm not the only one out here!! There is another solo circumnavigator out here, about 1,200 miles from me, Alessandro Di Benedetto. I heard about him through the comments on my blog, and since then have been in contact through email. Its neat to think that someone else is out there doing the same thing as you, and so close! He's trying to break the record for the smallest boat to sail around the world. I don't know too many of the details, I just know its a 20ft boat, and that is really small! I should get some wind tomorrow with the next front that passes through. Frequent fronts on the horizon for the next while. Today has been a pretty quiet day with not a whole lot of wind. I'm just slowly headed towards the horn. Yesterday was pretty much the same until the evening. Last night was a little exciting. 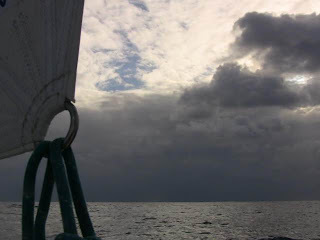 The wind picked up to 25-30 knots with a large swell that unfortunately was on my beam. At about 2 in the morning, I was asleep down below when I woke up a little dazed, wondering how my dishes that were kept in the sink had made it all the way into my lap all the way across the cabin! I then noticed that I was sitting on the wall, not my bed. (just goes to show you what a comfortable bed I have!) Well, my auto pilot went into standby mode and so I jumped outside and grabbed the tiller just in time to keep Wild Eyes from gybing. I got her back on course and set the auto pilot again. I walked around to check over the boat, every thing was fine, a little tossed around, but nothing broken. Because I was alseep I'm not sure exactly what happened. 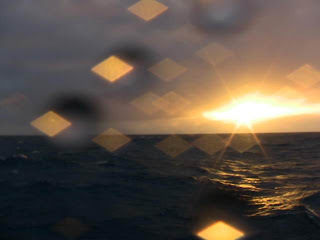 With the swells as they were, it could have just been a large swell that knocked Wild Eyes over. It was funny to find in the morning when I called home and told my mom, she was more worried then me! Everything happened so fast, there was no time to be worried - just to take care of things and get back on track. That is definitely the most excitement I've had so far on my trip. It looks like the next few days could change that though if all goes according to the weather report! Things have been going well out here. Unfortunately, I don't have very steady wind but I'm still managing to make some progress. Its starting to get really cold! Its still quite possible that I'll be up on deck reading a book when rounding Cape Horn, but I'm beginning to think that while out there I'll be in an Eskimo suit...not a swim suit. I was surprised by how fast the temperature changed. Just two days or so ago it was nice and warm but all of a sudden it got right down to 60F. Its not just the temperature that has changed. Everything around me from the constantly breaking waves to the grey sky is different. Not more than three days ago there was still the bright blue water, clear sunny skies, and warm wind. Things may not have started to roar the minute I entered the 40s but the past few days have made it evident that I'm in them. Its cold, and rather then everything being bright blue as it had on the equator, everything has now turned grey. Its an all together less inviting sight than the equator, but its exciting and it feels like I'm really getting into my trip now. I've spent the day checking up on things; belts, filter, lines, and sails. I did a little housework as well. I cleaned out the cupboard under the sink, pulled out some warmer clothes so they're easy to get to when I need them, and checked out all three of my heaters to make sure they're working. I've also been working on drying out my boots. They got soaked inside and out so while covered from head to, well, ankle, in foulies my feet have been very uncomfortable when I'm outside!! I've been keeping the boat closed up tight and compared to outside its very warm (I'm not sure the temperature outside, my thermometer is down below). With the companionway door closed the windows fog up and the roof is wet from condensation. I usually leave the one little window above my bed open. It does let in a little cold breeze but I'd rather a cold breeze than suffocating. I have had quite a bit of time to think out here. Suffocating would be a pretty miserable ending to my trip so I'm really very happy to put up with a little cold air! I know a lot of you are watching the wild weather that is brewing down here. More on that tomorrow. I'm into the Roaring 40s!! I crossed over into the 40s late last night. The skies didn't turn black, there was no roaring wind or crashing seas, no pouring rain or anything else. In fact, all there was to hear was the occasional flogging of my sails as the little bit of wind I did have faltered in and out. Every big event that has taken place during my trip seems to be maddeningly calm and slow. When I left Marina del Rey, there was barely enough wind to keep my sails full, I almost crossed the equator twice in one day because there was no wind and a current pushing me backwards and now I have a good day with lots of wind but I get into the "Roaring" 40s and my wind dies. Next thing you know I'll be down at Cape Horn up on deck in a swimming suit reading a book! As frustrating as it is, I guess I am really lucky to have such calm weather so far, even if it doesn't make for many exciting stories. The wind is beginning to pick up so hopefully I'll be able to make up for the slow day. My chart desk seat is much more stable. Whether thats due to the Velcro thats all over the bottom now or just because of it being calmer out I have yet to find out. It was nice to have a little bit of calm weather and sun to give everything a good check over, finish up a few jobs, and get the batteries nice and full from the solar panels. I'm about two weeks away from Cape Horn now and very excited to be getting so close! Well, thats all for now. Thank you all for your comments! I really enjoy hearing from everyone! Just a quick blog tonight. I have made good progress today in great winds. I have 30 knots out of the N which is good for making progess SE. I have to dig out another propane tank and fix a new leak in the water ballast but I will get a longer blog out tomorrow. The winds shifted around so I've stopped heading SW. I can now head SE which is a big relief, I was beginning to get worried about running into New Zealand sometime during the night! Well, I'm not really that close to New Zealand, but it feels good to be heading more directly towards where it is that I'm supposed to be going. The winds also picked up to a nice 15 knots. I'm finally moving and going at a steady 8 knots. The past few days I had been going about 4 knots which isn't exactly standing still but 8 knots is the kind of speed where you can look at the speed gauge with out feeling depressed! It has gotten really cold out here recently. It must be all the cold fronts that are around here bringing cold air from down south. Last night it got down to 70 degrees! Seventy degrees probably doesn't count as "really cold", but I did have to put a jacket on! Its been really nice having it so much cooler out. Its made everything a lot easier including blogging. It had been so hot and miserable down below that I just ducked down below to write my blogs real quick and then was back outside dumping buckets of water over my head! With the cooler weather I've been able to spend a lot more time down below now, and its been nice. Most everything on board is working at the moment, so I haven't had a whole lot to do. I've been working with Scott, from my team to try and sort out some small auto pilot problems, going over every thing everyday as usual, and tossing the occasional flying fish back into the water. I still haven't had any luck fishing and I really haven't seen any sea life. I'm a little surprised by how little sea life I have seen so far. When I first left Marina del Rey, hardly a day went by without having dolphins playing around the boat. Around Cabo I saw a few whales but since then I haven't seen a thing. I do know that there is something out there, as I am on my third fishing lure! Okay, not sure if this will work. I'm sure you'll all let us know! Good news! I found my hair brush! I had been thinking about dreadlocks, they would definitely be easier out here... but, I don't know, I guess they're just not really my thing. Forks work very well for brushing hair. When I was sailing down the east coast with my dad and brother I forgot a hair brush and had to use a fork for ten windy days, but my hair was a lot longer then, its easier with my hair as short as it is now! Also, I have a little wind, not much but a good enough amount to keep moving. The bad news is its still coming from all over the place. I would rather have wind like this than none at all, but it looks like I'm in for another long night. 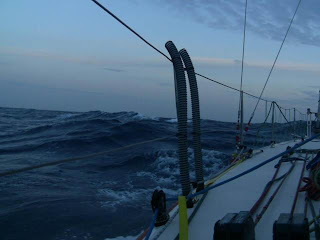 Last night a didn't sleep much because the wind is changing too often and I keep having to change course. I slept a little today so I'm not really that tired. Then there is a system sometime this weekend that is supposed to be pretty gnarly. I think I would have to classify this as good news though. I'm really excited as its going to be my first big front since leaving. The boat is ready, I'm ready, and I knew that sooner or later I would get into something big. Do you have paper charts? Yes, I mainly use my chart plotter, but in case my electronics were to go down, I have paper charts for my whole trip. Why is your course so far off Cape Horn? Right now I am heading pretty much straight south. The wind is coming from an angle where I cannot sail south east (more towards Cape Horn) When planning routing you have to look at all of the wind patterns. 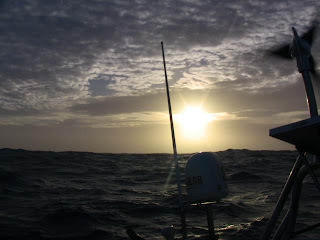 Soon I will be into the southwest winds which will give me a good position for heading east to Cape Horn. Are you out of fresh food? Yes, I have been for quite awhile now. And no, I don't do any baking. Will I go to Easter Island? I'm not planning on it. Since I was able to re-start from Cabo san Lucais I am still hoping to go the rest of the way with out stopping. Is your AIS working? Yes, my AIS is working, both transmitting and receiving. I had been having trouble with it at first but it is up and running now. 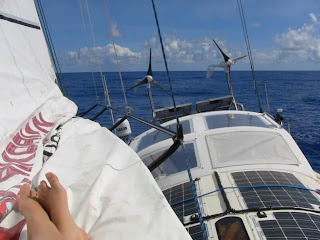 Re: reefing in 5 knots In the picture in my last blog where the main sail is reefed, I had to reef so that I could reach to hook the main sail back to the truck on the mast. It somehow unscrewed itself. Its much more comfortable to have the sail to sit on while sitting up on the boom and I took the picture while I was up there. Don't worry, that reef came right back out as soon as I was done. RE: outer track for staysail sheet: There is an outer track for the stay sail sheet and jib sheet, but as I have had the jib out for most of my trip so far I leave the jib sheet running through the outer track. If I was going to have my stay sail out for any length of time I would switch them. P.S. 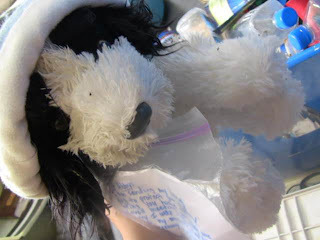 Jimmy, Mr. Doggie is doing very well! He seems happy out here but I think he misses you. Today has been a very slow day. I haven't had over 5 knots of wind all day and its been coming from all over the place. My clothes survived the night outside, they even made it through a squall! Its all safe down below now. Wild Eyes does really well in light wind. In 5 knots we were doing about 4kts, but its not going to be fast enough to get me to were I needed to be to use the cold front to push me down to the Horn. Luckily there is another front coming on Monday or Sunday, so I should be able to use that. I was doing some cleaning today (again) and I found the book I had been reading! I keep on misplacing it. This time I was quite sure it was gone for good since I hadn't seen it since Cabo. The book is the Hobbit. Its not really the type of book that I usually would read but a friend gave it to me way back when I was in Rhode Island picking Wild Eyes up and its really a good book! Now, if the wind will just stay coming from one direction for more than ten minutes, I'll be able to find out what happens to Mr. Baggins and the dwarves! The wind has died down a bit today. My average speed was about 6knots so I'm still moving along - just not as fast as I would like to be. I was having a lot of fun with the 20 knot tradewinds! From the weather report it looks like I have a cold front I'm headed into. I had hoped to hit it at a better angle but nothing is for sure with the weather. There are all kinds of wind angles and strengths where I am headed so it will be interesting to see what I get. According to the grib files (the weather forecasting software that I use on the boat) there won't be over 35 knots. I have a weather router who sends me reports every few days as well. He really has a much better idea of what is going on out there because he is looking at more than one weather model. I like to look at the grib files because it is really great to have all the details right here to look at as well. Its over a month since I left Marina del Rey and going on a month from leaving Cabo. Before this, I had never spent so long at sea alone, but it really doesn't seem like a big deal. I am hopeless at keeping track of time out here. Day after day I do the same thing, so the days really blend together. There is everyday maintenance, or rather, maintenance prevention, of just going over the boat checking everything, checking lines, sails, belts, filters... cleaning off solar panels, tidying up the cockpit, topping off the water tank. So far I've had very few problems, and anything that has happened I've been able to take care of before its turned into any big problem. I've patched up my gib, changed the engine diesel filter, cleaned out the water maker filter. I've flushed out and refilled my water tank (I had been having problems with the water being dirty, but its all cleared up now) and tightened the alternator belt a few too many times. Tightening that belt has got to be one of my least favorite jobs as it requires a few more hands then I've got, but I have to say, I'm getting pretty good at it! 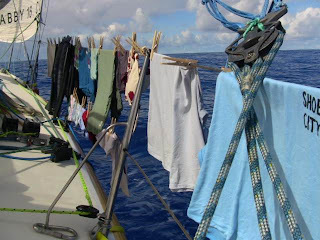 Today I did laundry and its all hanging out side right now, hopefully it will dry before I get any squalls or much more wind! 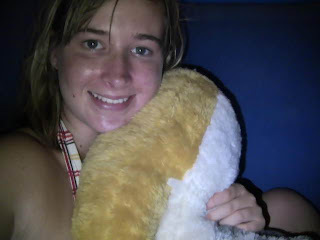 My buddy charlie (a pelican) and me. I've lost my hair brush again, as you can probably tell.